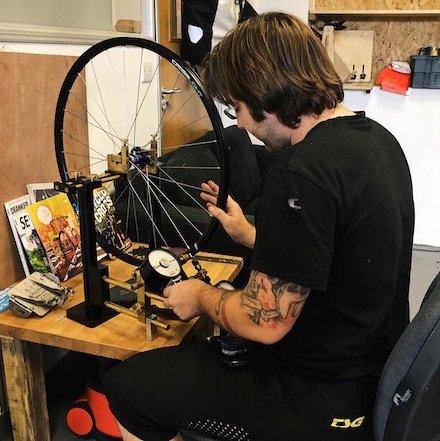 Today on the blog we speak to Ryan, founder of RyanBuildsWheels, a wheelbuilding workshop situated on the ground floor of Kingsland Studios. When Ryan moved to Bristol he quickly decided that bikes make a concrete difference to the world. From that moment on his business took off. How long have you had your space at Meanwhile Creative and what has it meant for you? Since circa April 2015; spanning three different buildings – Lincoln Street Warehouse, Freestone Studios and now Kingsland! My workshop is very often my sanctuary; being able to work at exactly the pace and in a way that I want is priceless. And I can turn my music right up! Can you briefly sum up your business and how it started? I craft lovingly laced custom road, mountain and touring bike wheels to perfectly suit each rider’s needs. I find wheelbuilding a very Zen practice. Additionally the science of how a wheel comes together, what makes a wheelset that is truly superb, and the tight tolerances required to work to the level I do (some of our wheels weigh less than 950g a pair!) is intensely satisfying. What started out as a passing interest and a necessary part of my trade in 2014 became a full blown obsession before turning into a part and finally a full time business. 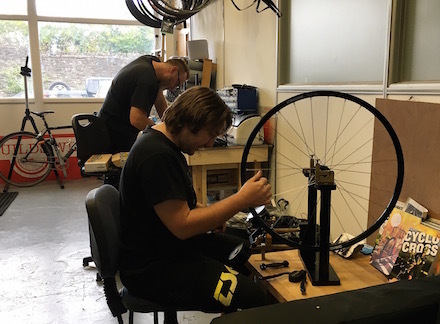 Is there a reason why you decided to start your wheelbuilding business in Bristol? I came to Bristol just over a decade ago to do an MA in Performance Studies. I quickly decided that bikes make much more of a concrete difference to the world, and continued a lot of work I’d been doing for Sustrans; The UK’s sustainable transport charity, whilst teaching myself mechanics. 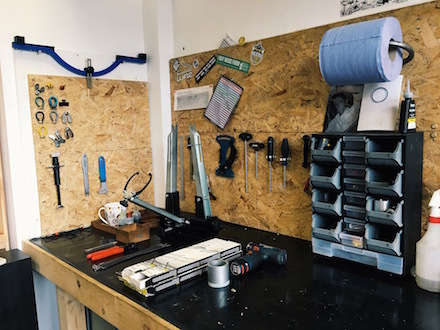 I’ve worked in some of the highest end, busiest bike shops in Bristol and am proud that my high level of skill and knowledge is all self taught. DIY Punk Ethics FTW! It sounds like you have a lot of knowledge on wheels! Are there any other members of the team to help you out? Could you tell us one interesting fact about your business? 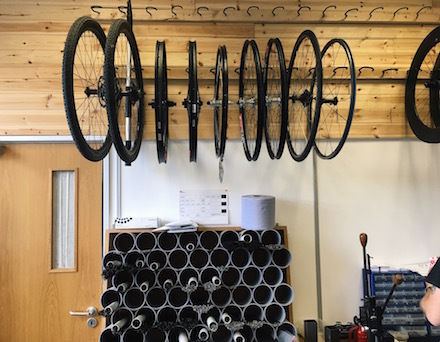 A properly and well built custom wheel can have spokes each holding up to 125kg…on a touring wheel that means that the equivalent of just over four metric tons is what’s holding your hoops together! They’re a perfectly pre-stressed tension balanced structure; very much like, say, the Clifton Suspension Bridge! Are there any big plans or projects coming up that you can tell us about? Www.SpokesFromRyan.com launches soon, selling spokes to both the trade and public worldwide; we’ll be concentrating on that in the autumn. What are the best and worst parts about running your own business? Not having a boss. We’re moving towards becoming a workers’ co-operative because the division of labour and pay in society is simply messed up. I’d say the worst part is not having enough time in the day! Luckily I have Pete on board and the aim is to employ a third member of staff within the next year. And finally are you personally involved in any other projects at the moment? We have a garage band called ‘Dr Thrombosis and his Dire Prognosis’ for all your droney psych rock needs; we’ll never be playing any gigs so don’t wait up! You can take a look at Ryan’s work on his Instagram and website or even better head down to Spoke and Stringer this Saturday! Ryan will be exhibiting his work at the Ride Culture Pedal event as part of Bristol’s Cycling Festival. Head their website for more details!